At least once a week, I find pennies when running, walking or just out and about. Sometimes one, sometimes a handful. I have this thing about them being heads up. True or not, some part of me believes heads is good luck, tails not as much. So the latter get tossed up to see if they’ll land the opposite way and wait for someone else that might need a little luck to come by and find them. 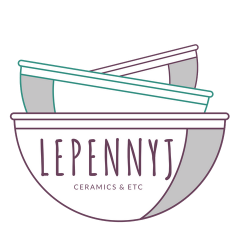 It’s not a great story but that’s where the name LePennyJ came from. I’ve long tried to figure out how to explain how I chose it when I started working with clay. And, it’s always been the same reason but I’ve had a difficult time putting it into words outside of my head. Maybe I’ve done it this time. The J was always easy. It’s me, Jessica. And, Le? Nothing to tell there really, it just seemed to fit. I feel very lucky for the opportunity to: play in the mud (basically), to make useful (and not so useful too) things by hand, to share the good works with others, to learn from the frequent accidents (both happy and the not-so-very also). So, that’s the rest of the story. Bunch of chores at the studio this morning – lots of clay to recycle, a few bowls to trim (probably my least favorite part of the making process) and a redo on a piece that I got a little too “creative” with . . . it was a nice simple piece and I should have stuck with a nice simple glaze. But the gas kiln was being loaded and when it’s good, it’s very good so I played. Likewise, the opposite can also be true . . . and I’m back to the beginning. Which is okay, and not an altogether bad place to be. Anyway, thinking it was going to be a pretty quiet morning, I revived my ooooollllllddd MP3 player on the drive in and was pleasantly surprised to find there were a couple of things I hadn’t yet listened to on it. “One More Thing” was a great distraction, short blips of stories just quirky enough to keep me engaged (and laughing) all the way through the tasks at hand. Next up – “Calypso” and Etsy updating.